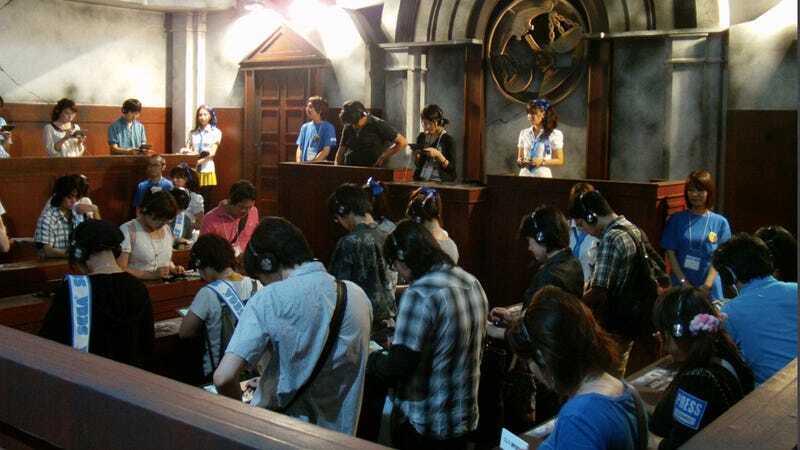 Today at the Tokyo Game Show Kotaku was able to experience 15 minutes of tense courtroom drama with the first playable demo of Ace Attorney 5. In the demo, Phoenix finds himself defending a young girl accused of bombing a courtroom with a bomb hidden in a stuffed animal. Also involved is the younger brother of everyone's favorite prosecutor pushover, Winston Payne, and a member of the bomb squad who doesn't seem to be telling the truth while on the stand. Luckily for Phoenix, his new—and previously unnamed assistant—Kokone uses her wristwatch computer to let him view the emotional state of the witnesses in the case. By comparing the strength of the emotions the witness is showing—happy, sad, angry, and surprised—with the emotions you'd expect given their testimonies, you are able to find the one that doesn't fit and push for an explanation. Other than that, the game plays identically to previous titles, with Phoenix being able to press for more information and present evidence that contradicts the testimony of witnesses. Graphically, the game looks great—especially on the 3DSXL—and the fluid animations of the 3D models look far better than the promotional photos implied. Moreover, there are now dynamic camera movements that add to the game's courtroom drama. The soundtrack is now fully orchestrated and is filled with new remixes of all the classic Ace Attorney themes. The only downside is that, unlike Professor Layton VS Ace Attorney, there are no voices in Ace Attorney 5 (aside from the classics like "Objection!" "Hold it!" and "Take That!"). In my brief 15 minutes with Ace Attorney 5, the game felt like it was an improvement over past titles in every way while at the same time was remaining true to the spirit of the series as a whole. Simply put, from what I played, I have no objections when it comes to Ace Attorney 5.